Do you like sweets as a culinary attendant with your afternoon coffee cup, too? I must admit I need some sweets with it. It has become some kind of tradition for me and I usually prefer some homemade sweets. It is nothing better than having some fresh homemade cake, cookie, or muffin in attendant with a cup of black coffee! Especially when fall is coming. I like this cosy atmosphere when I sit at my table with a lighted candle and something sweet to grab, and of course with a hot cup of coffee. 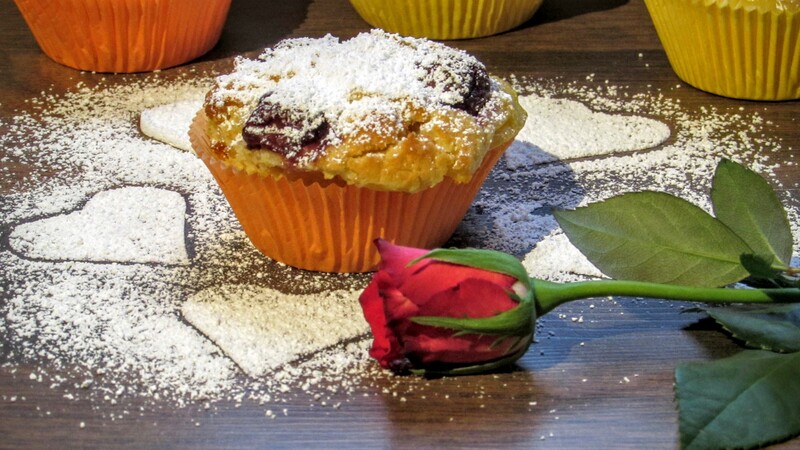 That is why I present today some muffins, which I created on my own. 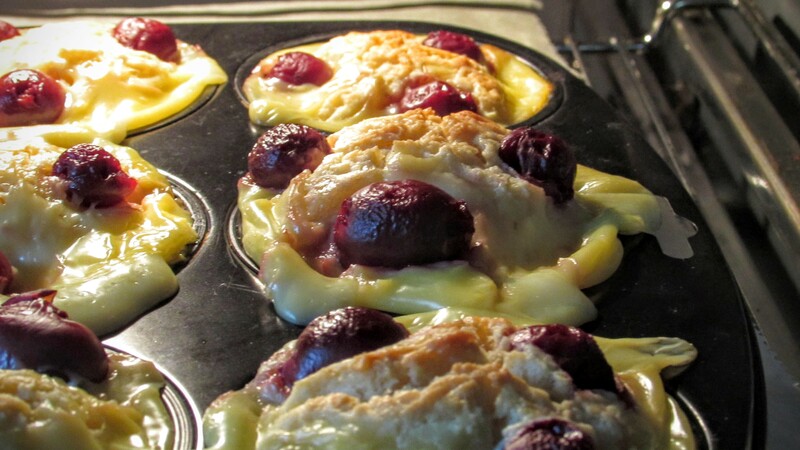 These Cherry Muffins with Vanilla Pudding are delicious and an eye-catcher. I hope you like them too. Their preparation is a bit elaborated, but trust in my they are worth the effort. Enjoy baking and eating them. One last remark before I start baking, this recipe is also available in German. Just click here. Take the butter, the eggs, the plain yoghurt, and the milk out of the fridge so that they reach room temperature. Line the muffin pan/tray with paper muffin cases. Prepare the vanilla pudding according to the instruction given on the packing. I use vanilla pudding powder that has to be cooked. When the vanilla pudding is cooked remove the cooking pot from the heat, and allow it to cool. Allow the morello cherries to drip off on a sieve. Preheat the oven to 180 degrees Celsius (360 degrees Fahrenheit) upper and lower heat. Put the dry ingredients (that is the Demerara Sugar, the wheat flour, the baking powder, and the salt) into a bowl and mix well. In a second bowl beat the eggs and then mix in the plain yoghurt and the melted butter. Add the dry ingredients into the second bowl and stir well until the Demerara Sugar has dissolved. 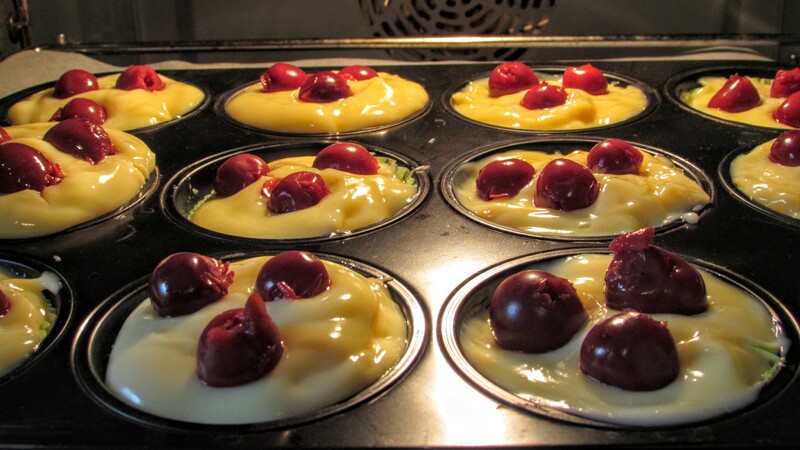 Fill the dough into the muffin cases and add a teaspoon of vanilla pudding and the drained morello cherries on top of them. Bake in the middle of the oven for 35 minutes (approximately, depending on your oven). 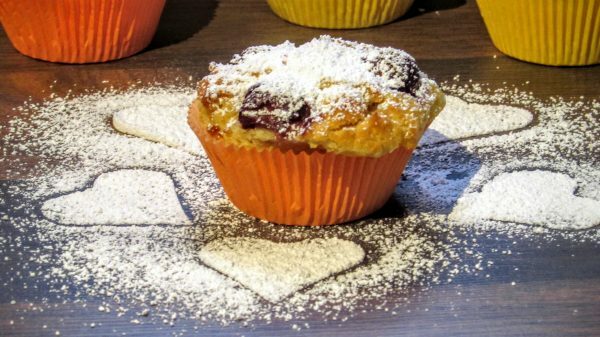 Allow the muffins to cool, before dusting them with the powdered sugar.